The founder of an organization that has influenced the Obama Administration's media and information policy, is both reporting on and leading the labor union/socialist occupation occupation of Madison Wisconsin. John Nichols founded Free Press, "a national, nonpartisan organization" with Marxist Robert McChesney in 2002 to "engage citizens in media policy debates and create a more democratic and diverse media system". Free Press has contributed former affiliates to Obama Administration positions, including pro Hugo Chavez "Diversity Czar" Mark Lloyd and State Department policy adviser Ben Scott. John Nichols from The Nation and the Madison Capital Times has been a major national spokesman for the strikers and demonstrators currently occupying Madison Wisconsin. 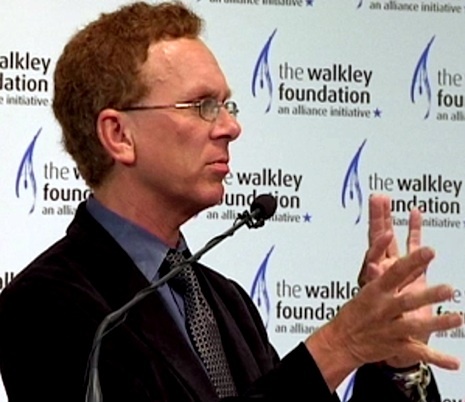 Nichols has not simply reported events in Madison, he has played a major activist role in the disruption. Nichols is a very influential journalist - he is also a committed socialist, with close ties to America's largest Marxist organization - Democratic Socialists of America. Based in Chicago In These Times includes former Weather Underground terrorists and Obama associates Bill Ayers and Bernardine Dohrn on its Board of Editors. Nichols is an I.T.T. contributing editor. Democratic Socialists of America kicked off events at the 2000 Democratic National Convention by organizing a major panel on the presidential and congressional elections. Panelists John Nichols, Maria Elena Durazo, president of H.E.R.E in LA, and Antonio Villaraigosa, then Speaker Emeritus of California’s Assembly, later Mayor of Los Angeles and member of the Obama Transition Team. 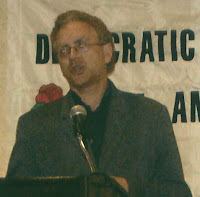 John Nichols, was a featured speaker at a media workshop held in conjunction with the Democratic Socialists of America 2001 National Convention in Philadelphia. He discussed with the audience "various ways of having an impact on media in an age of media concentration and decreasing attention to local news". In 2006 attendees at the Chicago Democratic Socialists of America local’s 48th annual Debs-Thomas-Harrington dinner heard keynoter John Nichols predict that “this year is the end of [the Bush] administration. The only thing that stands in the way is the Democratic Party". On the weekend of March 18th-20th, 2011, the D.S.A. junior wing, Young Democratic Socialists held their annual Winter outreach conference "Their Crisis, Our Pain: The Democratic Socialist Response to the Great Recession". Former Obama Black Advisory council member Cornel West was the featured speaker, alongside John Nichols, New York ACORN leader Bertha Lewis, DSAer Mark Engler, and Dan Cantor from the Working Families Party. Nichols is also close to the Communist Party spin-off Committees of Correspondence for Democracy and Socialism. At the C.C.D.S. National Conference and Convention, July 25-28, 2002, San Francisco State University, the Plenary Panel and Discussion on Electoral Reform and the Struggle for Democracy comprised; John Nichols, former Berkeley mayor, D.S.A. and C.C.D.S. member Gus Newport, "peace" activist Medea Benjamin, and C.C.D.S. leader Mildred Williamson. John Nichols, "The Nation magazine writer, who covers electoral issues", addressed the C.C.D.S. 5th National Convention and Symposium July 20 - 23 2006 in Chicago - Panel 3: "Strategies for Winning at the Polls in 2006 and 2008". John Nichols is more than an activist and journalist. He is a propagandist. His mission in life is to increase the ability of the far left to reach the American public with its message. Whether influencing the Obama Administration toward "net neutrality" or rabble rousing in Madison, John Nichols is an influential opponent of American liberty. I see this fellow "Nichols" was with the Nation magazine (publish by the American Jewish Committee). I don't understand why some of my friends are so supportive of Israel when so many Communist and Socialist leaders/agitators in America are of the same nationality. It's a paradox. Before conversion to Christ, C.S. Lewis' wife was an atheist Marxist of Hebrew background. She rejected the false ideology of Communism after coming to faith in the Messiah. Dr. Fred Schwarz was a staunch anti-Communist and founded the Christian Anti-Communism Crusade (www.schwarzreport.org). He was also a Jew for Jesus.